Recent revolutions in materials science allow researchers to manipulate materials at the level of individual molecules and atoms. Scientists take advantage of these breakthroughs to create methods of controlling the location, timing, and dosage of drug administration in the body. Such techniques would be a particular boon to cancer patients because chemotherapy medications are toxic to both tumor cells and certain healthy cells. As a result, when those drugs are administered through traditional means and allowed to circulate throughout the entire body, they produce severe side effects. If the drugs could somehow be contained until they reach a tumor, the treatment would be both more effective and less harmful to the rest of the body. "Over the past decade, significant research efforts have focused on designing nanomaterials whose properties and, therefore, behavior are regulated in a programmable fashion," says IRP senior investigator Xiaoyuan 'Shawn' Chen, Ph.D., the new study's senior author. "The challenge is to design and synthesize a drug delivery system that is sensitive to both tumor-specific internal stimuli like pH and external stimuli like heat or a magnetic field." In their new study, Dr. Chen and his team did just that. Their cutting-edge drug delivery system relies on two separate 'logic gates,' each of which acts as a safety switch to prevent the release of a drug unless a particular condition is fulfilled. Similar methods have been designed in the past that use one logic gate, but Dr. Chen's is the first to use two. "Two logic gates can achieve more accurate and controllable drug delivery and release," he explains. "Drug release can only be carried out under the condition that multiple internal and external stimuli are satisfied simultaneously, so as to reduce drug toxicity and achieve targeted release." Dr. Chen's treatment approach uses specially designed, microscopic packages called nanovesicles filled with a modified chemotherapy drug, which is composed of two molecules of the cancer drug doxorubicin connected to a dye molecule that heats up when it absorbs near-infrared light. Just like many traditional chemotherapies, the nanovesicles are injected into a vein and travel throughout the body, including to the tumor. The first logic gate is unlocked when a clinician shines a laser of near-infrared light into the tumor. When the laser hits the nanovesicles sitting amongst the cancer cells, it heats up the dye attached to the doxorubicin. The elevated temperature then causes another chemical inside the nanovesicles to break down and release unstable, highly reactive atoms called free radicals. The free radicals react with the nanovesicle's shell, which is made of a material that degrades when it encounters free radicals. Once the vesicle has disintegrated, the modified chemotherapy drug spills out into the tumor. At this point, the second logic gate is tripped by the acidic environment in the tumor, which breaks down the special chemical bond that connects the doxorubicin drug to the heat-generating dye molecule. Once unleashed, the drug is able to wreak havoc on the tumor. Numerous experiments showed that the drug delivery system worked just as Dr. Chen's team designed it to, preventing the release of the chemotherapy except when the nanovesicles were exposed to conditions warmer and more acidic than those typically found in the human body. Moreover, the drug delivery method markedly reduced the size of tumors in mice and prolonged the animals' lives while causing minimal damage to the rest of their bodies. Dr. Chen's team must now conduct further tests with different types of tumors. 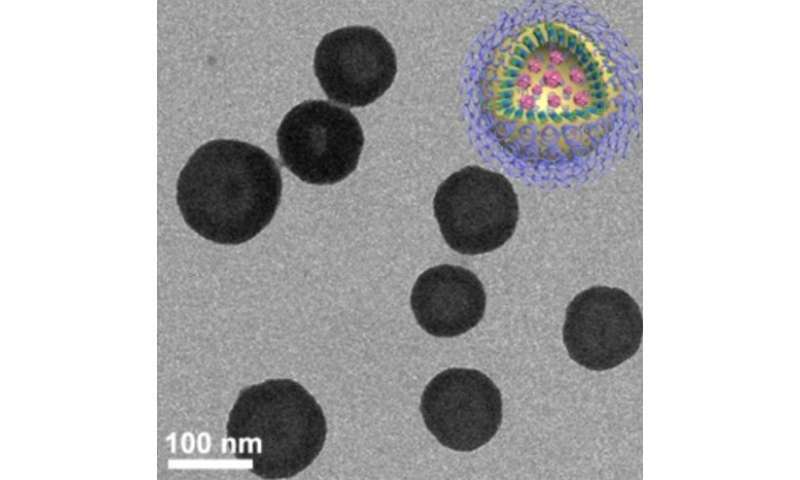 The group also plans to scale up their method for creating the specially designed nanovesicles, as well as explore other ways besides a laser to trigger the drug's release, since lasers can have difficulty reaching tumors in certain parts of the body. "It is a promising drug delivery and drug release system," Dr. Chen says. "It can control drug release more accurately and improve the therapeutic effect while reducing the toxic and side effects of chemotherapy drugs."